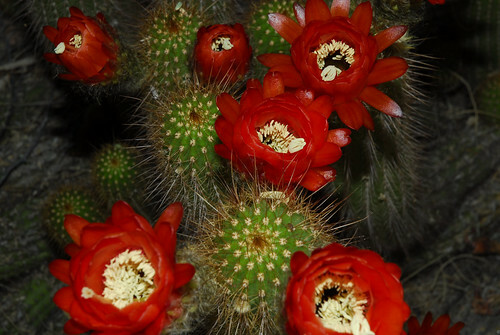 Cacti In Bloom, originally uploaded by phaelosopher. Beliefs manifest on an individual as well as a collective basis. My beliefs — about myself, relationships, “women,” life, money, health, “right and wrong,” etc., supersede collective beliefs. They set the stage, and become perceptual filters for the interactions and relationships that I have day-to-day. The outer life we experience will always seek to reflect our inner beliefs. If we want to change our life, we must first be willing to examine, and where prudent, change our beliefs. A change of our beliefs will foster a change in attitude. Perspective will then change. We will then “recognize” new signposts that guide us in an entirely different direction that we didn’t “see” previously. Each of us has that power, no matter who we presently think we are. Whether we share our heart-felt opinions/beliefs with others or not, we should know them, honestly. It behooves us to be open to understanding, for there is much more to “who we are” than meets the eye, than what we’re generally hearing from “outside” sources. Yet, what comes to us, in the form of information and knowledge, is directly proportional to the sincerity of our seeking. My seeking has led me to understand that God expresses through each of us, each and every moment, whoever we think we are, and whatever we may happen to be doing. I understand that, quite naturally, we attract thoughts, ideas, people, and experiences to us, as iron filings move toward a magnet. The difference being that we can change the nature of what comes to us, by elevating our self-image and esteem, and equalizing it in the esteem we extend to others. If we choose to express ourselves in the highest and best manner, as a way of life, and share it with others, then we’ll more consistently experience life in kind. What is the “highest and best manner?” It may or may not mean money, power, status, or prestige. In fact, if money, power, status, or prestige is our goals, then we may very well achieve them, but the “highest and best” manner may not result. The current president of the U.S., George Bush, certainly has money, power, status, and prestige. But from my perspective, the highest and best is not yet flowing out of his approach to domestic governance, or foreign policy. In the aftermath of the 9/11 event, we could have sought justice without vengeance. Even if “and eye for an eye” was our goal, with respect human casualties, we have grossly overachieved in the killing, maiming, and destruction index. Yet, we have not quenched our thirst for “justice,” because justice wasn’t really our goal. Peace wasn’t our goal either, because it was something we could have chosen unilaterally, just like we chose a destruction and intimidation military strategy to “get our way.” We haven’t… we’ve simply escalated the fear threshold, and empowered others to do so in kind. Setting religion aside, our concepts of, and relationship to God, love, and equality of beingness have everything to do with the day-to-day scheme of things, even how, or whether we “wage war.” Pacifism is one response that is often ridiculed by people who still believe that “peace” can be “won” by maiming, killing, spreading radioactive munitions, and destroying the land. They don’t understand that spirit cannot be destroyed, so that removing a body through disruptive trauma-causing action, doesn’t solve a problem. Pacifism is generally misconstrued as passivism, meaning that we distance ourselves and do nothing. However, creating no new harm does not mean doing nothing. It means no escalating the fear, hatred, and dis-ease index. It means being willing to extend rational behavior as a tuning fork to allow our erstwhile “enemies” to resonate to. We need to know that irrational people can be rational, even if they have acted irrational for thousands of years. In the same way that we cannot achieve peace through war, we cannot have a rational discussion if we are not acting out of, and from our own place of rationality. We have “played down” to expectations of our “enemies,” by fearing them, something that “leaders” should not be doing. It’s too easy today for a “leader” to fear another, then appeal to your worst fears in order to send your sons and daughters to “fight for our freedom,” all the while taking our freedom away! Yet, no demonstration of respect has been shown for the people we’re fighting and killing, whose land we are destroying. If they are not respected, then the Americans we are putting in harms way have not been respected either. If you doubt my words, consider how they are being — particularly, their illnesses — treated once they return. This is all happening this very moment! These are day-to-day issues that are played out based on our individual concepts of relationship, to God/Goddess, to self, and to each other, and then aggregated to a collective experience. Oftentimes, we don’t think much of ourselves. We are sometimes loathe to the idea of loving ourselves; quick to condemn, slow to praise. This is a God/Self issue. Who can imagine anyone with low self-esteem believing that God would give them the time of day, much less “express” through them? If we don’t allow the possibility of God expressing through us, then how can we ever feel empowered, energetic, and loving? We permit the possibility by giving the permission to the possibility of oneness with God, for us. One must believe it’s possible, and true before permission will be granted. Yet when someone else symbolizes an “enemy” to us, we’re disheartened. We fear easily, often because of something they think or do. We position ourselves on slippery slope of anxiety, envy, resentment, poverty, or dis-ease. These are classic signs of love deprivation. Not the love from God, but love applied to self, which is believed to be separate from God. We question our worthiness… of love, peace, happiness, companionship, wealth. As long as we do, we will struggle to achieve them, and likely resent those for whom such things come easily, not knowing or believing that, if we give up our anger, fear, and resentment, they can come easily to us too. When we let go of self-doubt and skepticism, and accept love as well as give it, life’s greatest treasures can be delivered into our personal experience. To question the power of love, or to make it conditional, is to distance ourselves from its transformative and transcendental effect. Thinking that a loving response to a problem is “impossible,” delays its possibility for the doubter. We are creators of our life experiences; you yours, and me, mine. We are the Lord of our Beingness. Several trillion cells listen to every thought — wonderful or profane — that we grace with belief or nullify by our disbelief. Whether expressed aloud or not, they hear, and will do what they can to position our physiology according to our own inner self-image, which is a “field” of energy, wherein our hopes, dreams, passions, and fears exists within and around each of us. Each aspect has its own resonant frequency and signal strength. We decide what to amplify according to where we focus our attention, and belief. Energy follows focus, and where focus is directed, energy grows. If we focus on disease, disease will grow. If we fear failure, we will become experts thereon. On the other hand, believe in our ultimate success, and see the realization of our inspired goal as we take the first step toward it, then that is what our energy will build. That is what will come into being. An inspired goal is love ladened and heart-felt. It builds hope and confidence by dislodging fear, day-by-day. Believe it, baby! Sue Ann, your point is well-taken. However, I believe that the “Universal Justice” you refer to likewise comes from within us… something we finally connect to, and allow expression through us. I don’t believe it’s necessary for “everyone” to “get” it… I believe in the “critical mass” theory, when enough of us understand and begin using our awareness consciously, with more consistency, it will dramatically change the collective human experience. Beautiful thoughts. Have you ever considered that all our calls for Justice, are simply due to our misunderstanding that Reality is it? Like the reality of 9-11, or the Murrough Building bombing? Ever given thought to what beliefs we keep sowing, that keep bringing such Univeral Justice down upon us? Love your site. Thank you! !